I have now analysed the comfort data for the winter. The monitoring started in November 2013, although some data was collected in October. The chart below shows the mean temperatures, relative humidity and carbon dioxide concentrations for the three rooms being monitored. I have only posted the charts for the first part of the winter here (I am analysing in quarters Nov-Jan; Feb-April; etc). The mean temperatures for November to January show a fairly even distribution across the house. The living room has a slightly warmer mean, probably due to the occasional use of the wood burner. Our thermostats for the heating are set at 18°C on each floor – this being our preferred temperature, not an attempt to be frugal. Relative humidity (RH) was a bit of a problem, causing some localised mould growth for the first few months after completion. I have attributed this to the drying out of the wet construction and finishes (mortar, plaster, etc), and because the house was becoming increasingly airtight with late commissioning of the ventilation system (switch on mid-September 2013). 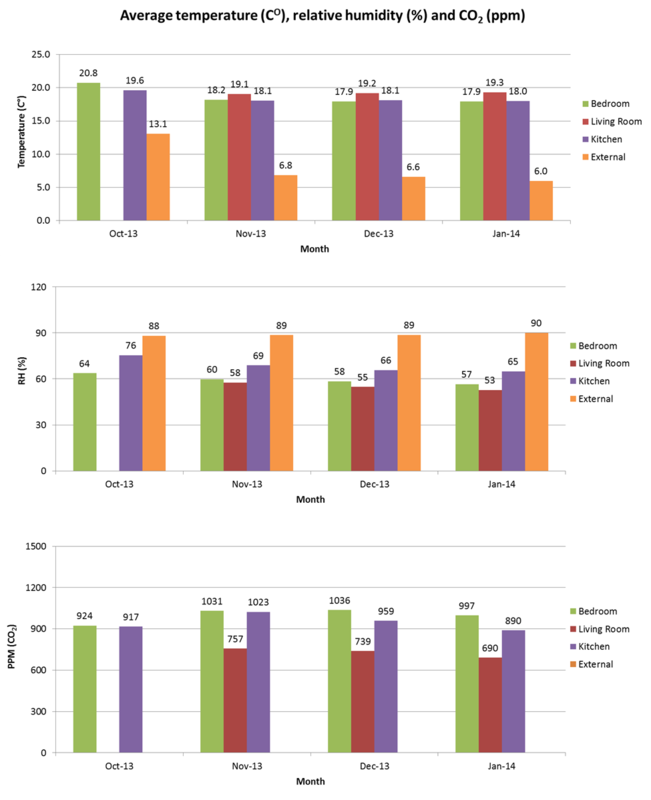 The mean RH should be between 40 and 60%, and the monitoring shows a steady decrease from November through to January. It is slightly higher in the kitchen, due to cooking activities. 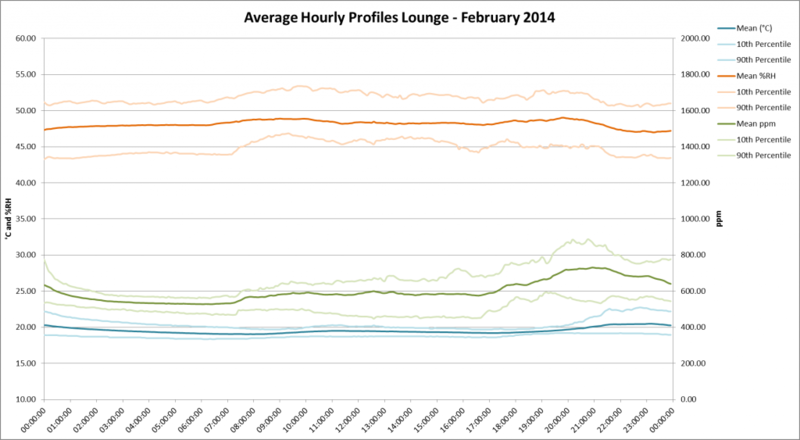 The RH has continued to drop in February and March (check back later for an update). The initial problem with mould has now disappeared. To maintain good indoor air quality, CO2 concentrations should average between 800 to 1000ppm. By keeping below or within this band, other (more serious) pollutants, such as VOCs, are kept within safe levels. 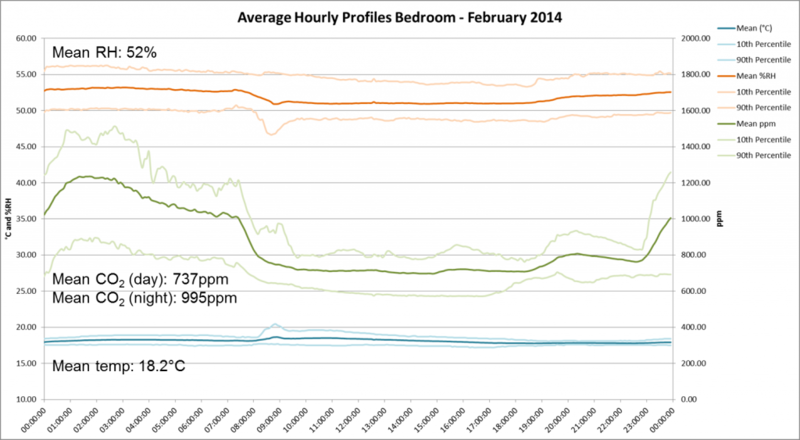 The measured CO2 levels are higher in the bedroom, as this is where we spend more time than any other room (that is being monitored). 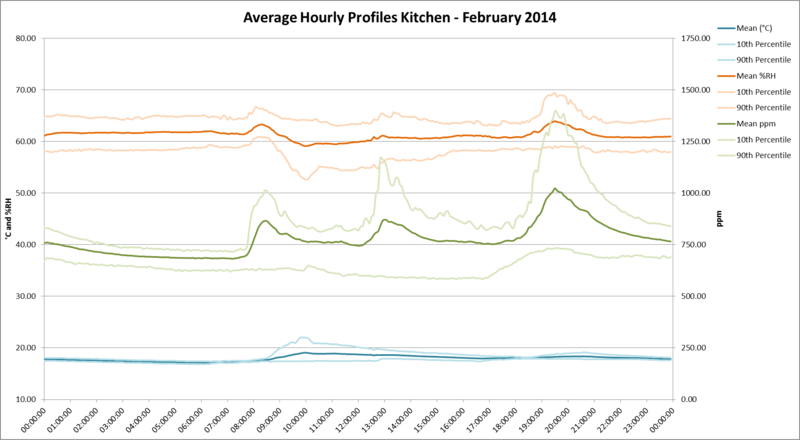 I have carried out some fine tuning to the ventilation in February and the average has dropped to below 1000ppm. However, I feel that reporting monthly averages for CO2 concentrations is not particularly representative, and therefore useful. CO2 concentration levels are only of interest when rooms are occupied. So, I will provide further analysis on CO2 in future posts, but what this overview shows is that we have no real concerns about indoor air quality.